A three-judge panel of the D.C. Court of Appeals took two years to deny a request to rehear one of the most important First Amendment cases since New York Times v. Sullivan. The defendant in the case is tired of waiting for a court to affirm that criticizing a public figure is legal. National Review asked the full municipal appeals court Thursday to review the panel’s 2016 ruling in favor of Pennsylvania State University climate scientist Michael Mann, who sued the conservative publication for defamation. Mann’s lawsuit in 2012 and the surprising legal decisions in his favor spooked the journalism industry, which has overwhelmingly sided with National Review. Mainstream media outlets and press freedom groups told the appeals court – four years ago now -that Mann was violating Washington, D.C.’s law targeting “strategic lawsuits against public participation.” Even the District of Columbia said Mann was violating its anti-SLAPP law. Earlier this month, the panel finally ruled on National Review‘s two-year-old request for rehearing. It added a new footnote to the 2016 ruling, amended an existing footnote, and denied the petition. That’s it. In an editorial last week, National Review blasted the appeals court for ignoring the anti-SLAPP law, which is expressly designed to discourage frivolous, expensive, time-consuming libel litigation. “That a slam-dunk case that is being examined under an expedited process should have yielded so many years of expensive radio static is a genuine national disgrace, and should be widely regarded as such,” the editors wrote. The silver lining, as noted by National Review Vice President Jack Fowler, is that the publication finally gets to appeal to the full D.C. Court of Appeals. A brief recap: National Review published a blog post that approvingly referenced a Competitive Enterprise Institute post that said Mann “has molested and tortured data in the service of politicized science,” just as Penn State’s Jerry Sandusky molested children. They were referring to Mann’s so-called hockey stick theory of climate change, and Penn State’s alleged rubber-stamp investigation of Mann for “scientific misconduct,” which cleared him of wrongdoing. The three-judge panel’s ruling essentially found that no one is allowed to criticize Mann’s work and methodologies because Penn State had cleared him. Adler, the law professor, compared it to blessing a lawsuit against people who called George Zimmerman and Darren Wilson murderers even after they were exonerated of unlawful killings of black teenagers. The criticism of Mann is nothing more than “pejorative characterizations of a person’s conduct,” which are not “provably false” and hence not “actionable,” the brief argues. It cites two Supreme Court decisions that expressly found the characterizations of “serious,” “gross misconduct” and “integrity violations” are not verifiable. 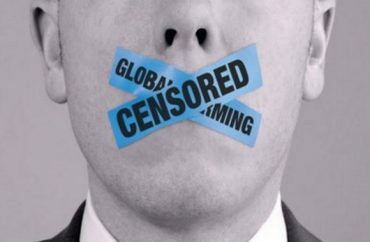 Even worse, the panel’s decision here stifles free speech on a matter of intense public concern: It authorizes punitive lawsuits against those who claim that certain data methods used in the global-warming debate are unethical and deceptive, effectively prohibiting expression of that view. In order to get around the obvious problems in its analysis, the panel invented a distinction between ambiguous speech where “readers expect to find spirited critiques,” and “garden-variety” libels against the “professional character of a person” such as Mann. The full court would gut the “actual malice” standard, which turns on whether a defendant “subjectively entertained serious doubt as to the truth of his statement,” if it doesn’t overturn the panel, National Review argues. inquiry into whether it ‘believed’ a statement it never published,” or put the publication on trial for its protected opinion, the brief argues. Under Mann’s own reasoning, validated by the panel, the outspoken scientist could be just as easily sued into silence, National Review points out. companies and other well-heeled interests” from suing their critics in Texas or Oklahoma, trusting that juries will “silence such criticism” for them.